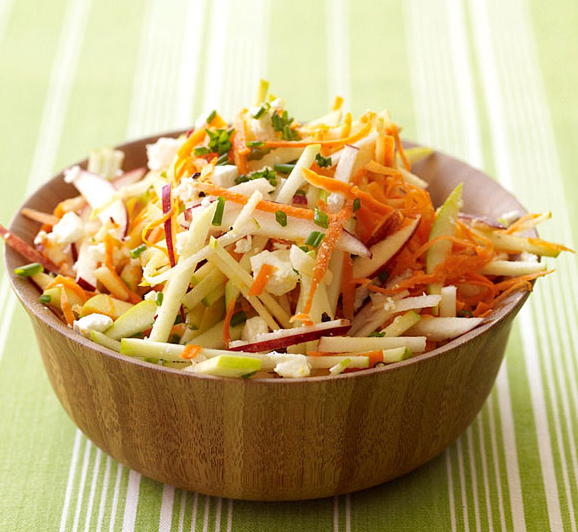 Apple Carrot Salad is like a fruity spin for the people who are conscious of there fitness but still cant resist loving food, this is a delicious slaw and very easy to make. You just have to buy the season's best apples and, a bag of thickly shredded carrots. Apple Carrot Salad is like a fruity spin for the people who are conscious of there fitness but still cant resist loving food, this is a delicious slaw and very easy to make. You just have to buy the season’s best apples and, a bag of thickly shredded carrots. Firstly place the apples in a large bowl and mix it with lemon juice. Now add all the other ingredients like carrots, chives, oil, sugar, salt, pepper and cheese; toss to mix thoroughly. It yields about 1 cup per serving. If you want more tang, use blue cheese instead of French feta, it will give it a few extra points.